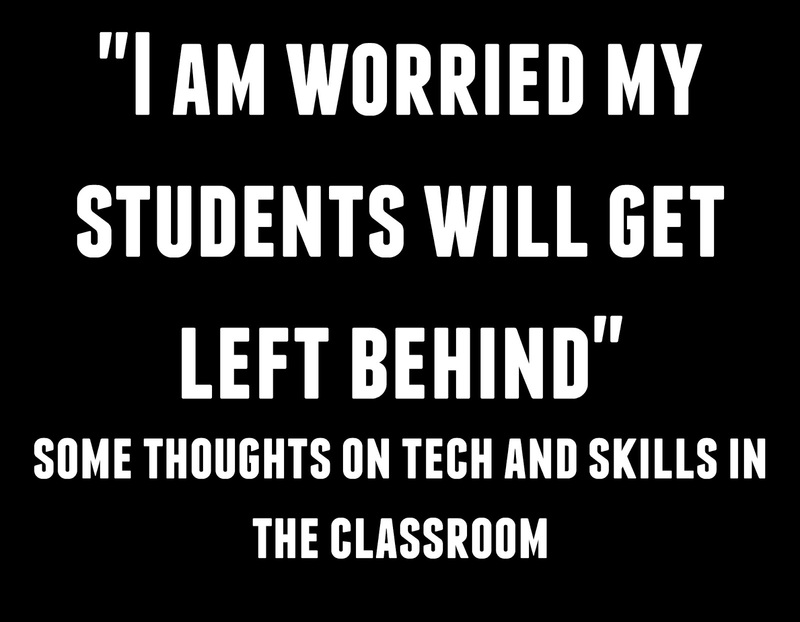 In my last blog post I made the following statement regarding tech in the classroom "Just because something is better for me as a teacher doesn't mean it is best for my students and this just might be an example of that." After writing those words and hitting "publish" I kept thinking about them and felt the need to address the real issue that led me to write those words. 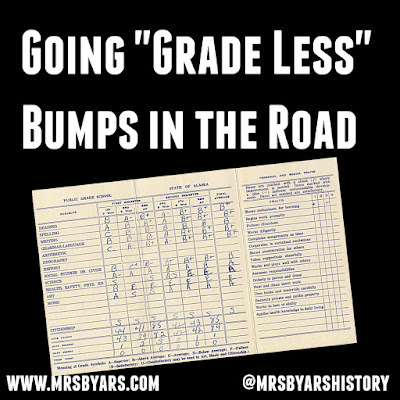 In my last post, I talked about challenges I was facing with reflective grading. A major challenge this school year has been consistent and equitable access to technology for my students. 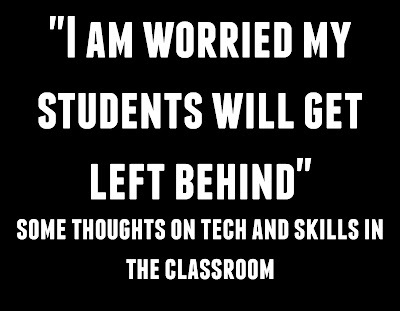 That week, I had to pull the plug on using technology to submit their reflections because I could not promise my students would have consistent and equal access to the technology required to do that. In that moment, technology was making my life easier but it was making things inequitable for my students. It was clear that I needed to make a change. But I have a huge problem with this. There are two conversations we can have about using technology in the classroom: one is a pedagogy based discussion on how technology allows for the 4 C's (critical thinking, communication, collaboration, creativity) to happen more effectively and efficiently in classrooms. I hope to write many posts in the future about this conversation but that is not my focus today. Today I want to talk about the more practical argument about skills that I often see pushed aside on Twitter or in PD on Educational Technology. Often education experts, administrations, TOSAs ask teachers to ensure that they are using technology in a way that embraces the 4C's, and how that should be the main goal and purpose behind using technology. I completely agree, we have to make sure every lesson we do is meaningful and purposeful whether it uses technology or not. But sometimes I sit in a room full of teachers who have only ever been teachers and I worry about when and where my students will learn the basic computer skills I needed to get a decent job. I feel stupid for writing that last sentence. I feel like if I raised my hand in a meeting and asked "how are they going to learn this?" the answer would be "we offer a computer class as an elective!" But that isn't good enough because not every student is going to take that class. And these are skills that every student needs. For every company I worked for (and I worked for a lot of them, I graduated college in 2007 when there were no steady jobs for graduates because of the recession) my skills on a computer and my ability to adapt to technology were tested. Are there jobs out there where you will never touch a computer? Sure, maybe, it's totally possible. But if our goal is to make students college and career ready and we are looking at what we can do in our own classrooms to help our students reach that goal, it makes sense to offer digital options to help build those skills. When I made the decision to ditch technology a few weeks ago and allow paper and pencil reflections I said it was because while digital grading was easier for me, it was causing problems for my students. But the problem wasn't the digital grading or the lesson or assignment: the problem was equitable and consistent access to technology. When students don't have consistent and equitable access to technology, I'm not worried about the 4C's, that's just good lesson planning and engaging teaching. I'm worried about my students not having the basic skills they need to land the job. I am worried they won't have experienced learning to quickly adapt to technology and because of that they will miss out on job opportunities or not be able to retain the jobs they do get because they are missing that skill. I am worried that my students will get left behind. So, let's keep talking about the 4C's and pedagogy and best practices and making sure we are using technology in meaningful and relevant ways but can we stop ignoring the conversation about skills? Can we stop pretending like that conversation is beneath us as educators? And can we please acknowledge that our students will live in a very different world than us, and we need to do all we can to help get them ready for it. How are we over a month in the school year? When did September happen? And why does this process seem so much more challenging than it did over the summer? 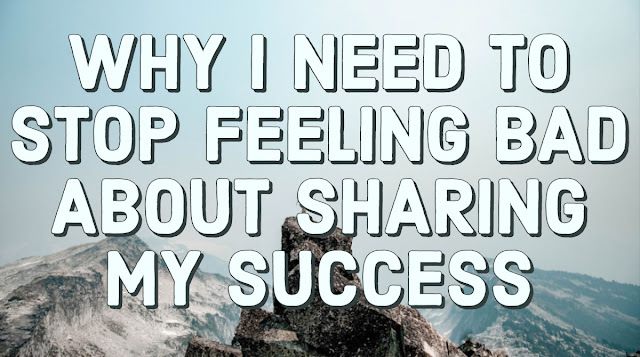 Last year, I became frustrated with the question "how many points do I need to pass?" and I spent a lot of time reading about grading practices. I even tried it this summer and it was so successful that I felt the need to do it this year as well. But right now, I have to be honest, I am feeling a little uneasy. Summer was so successful and now I feel like I am hitting some major roadblocks. I think I have solutions for all of them but I also feel the need to share some of the challenges I am currently facing. The first challenge is access to technology. Over summer I was lucky to have just enough devices in the classroom, and enough students with phones, that every student could be connected at once. I don't have that this year and while I have tried to make computer labs work and I've tried to embrace "you can finish this at home" that is not working for the majority of my students. I just sent my AP about 50 text messages in a panic. 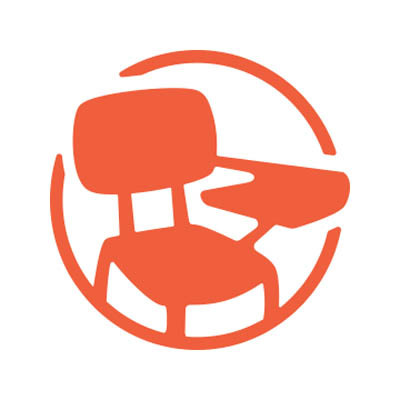 I know I need to pull students for small group work and give them time in class to work through the reflection process but there are no labs available (which is a good thing because people are using technology to help their students but bad for me because I have them do all reflections online). I just don't have enough devices for my classes this year and I haven't found the best solution to that yet. In my panic, I realized that there was another way. I felt ready to throw in the towel but while typing the words "I might have to go tech-less, I might have to totally re-think my approach to grading" it hit me: they can make reflection portfolios with pen and paper. Technology makes this process a lot easier for me as a teacher but right now it is presenting a challenge to my students because of how much access they have (or don't have) so when I pull small groups on Friday they will get pen and paper to reflect and will put together a portfolio (file folder) or work to submit as evidence. Just because something is better for me as a teacher doesn't mean it is best for my students and this just might be an example of that. The second challenge is timing. I was really inspired by how a few teachers in my department (specifically Mr Souza and Mr. Murray) spent so much time at the start of the year building relationships by having students present projects on themselves or about others in class. This year I completely changed how I started my year by stealing these ideas from them. But it meant that we didn't start really learning the reflection process until two weeks ago, which now makes me feel as though they are behind. They don't full understand the process yet because it takes a few rounds of reflections for all students to have that "ah-ha!" moment. Next year I need to find a way to incorporate the reflection process into the student presentations activity as well so they begin the reflection process day one. The third challenge is teaching students to articulate their own learning. I want them to move away from "how many points is this worth?" to "what will I learn from this?" I would rather a student question the purpose and meaning behind my assigning work to them then ask me how many points something is worth but when that is all they have known the habit is hard to break. I am thankful to work with so many teachers who teach growth mindset to our students but when they ask "how many points is this worth?" the points mean more than the learning and making the shift away from that is incredible challenging. I realize I need to do more work developing Growth Mindset lessons into my classes, I teach history but I need to take every spare minute I can to help create this cultural shift. Right now, I feel a little defeated but I keep going back to the survey results from students over summer. I keep looking at their grades and their growth in those few short weeks and I have to keep telling myself that I knew this year would present new challenges and obstacles when trying this method.